Concord Biotech houses a sophisticated microbiological laboratory with well qualified and highly trained microbiologists strictly following cGLP guidelines. 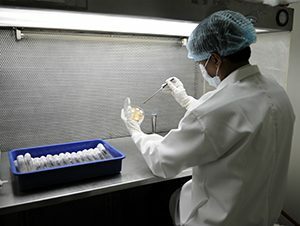 The microbiology laboratory is well equipped for maintenance & propagation of microorganisms, inoculums supply to plant and in-process quality check. There are separate clean rooms and lyophilization facility for long-term storage of microorganisms. The microbiology laboratory at Concord is designed to meet the bio-safety level 2 as per the international guidelines for the safety of microbial laboratories as suggested during the Geneva Convention. 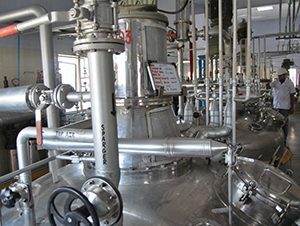 Concord Biotech API facility consists of multiple fermentation blocks having fermenters of 5 m3, 10 m3, 15 m3 and 20 m3 capacities with total fermentation capacity over 500 m3. The fermenters are supported by multiple seed fermenters and dosing vessels. The inoculums are provided from a dedicated inoculums preparation facility. The entire facility is under observation through an automated control system, which is controlled by the expert support staff of microbiologists, biochemical engineers, chemists.